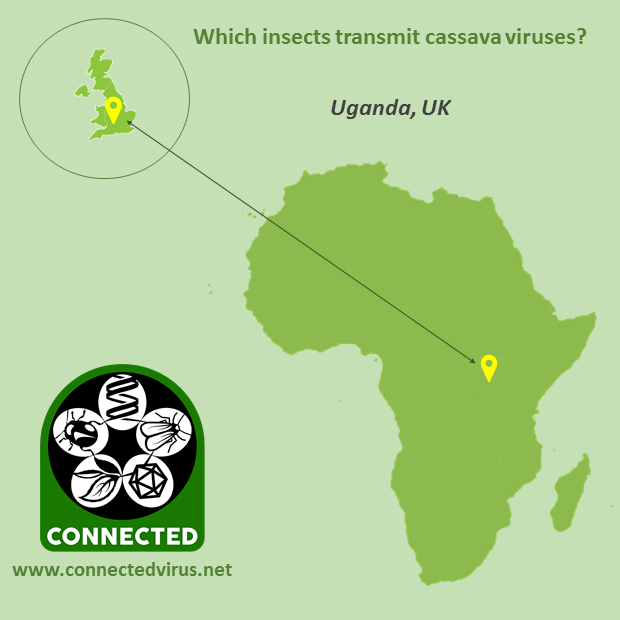 Which insects transmit cassava viruses? Whiteflies are known to play a role in the spread of Cassava Brown Streak Disease (CBSD), which is caused by at least two viral species: Cassava brown streak virus (CBSV) and Ugandan cassava brown streak virus (UCBSV), collectively known as U/CBSVs. visiting Ugandan cassava fields infected with CBSD to sample aphid populations and running detection tests to identify whether they contain U/CBSVs. These experiments will provide insights into which insect vector transmits CBSVs, providing information to help manage and survey CBSD, which may need to include aphids as well as whiteflies. It will also shed light on currently unknown CBSV genome sequences involved with insect transmission.